The primary function of the mesh is structured contflex land confinement, mixtures of soil and lime, mixtures of gravel-cement, other materials. Thus gravity walls are constructed to allow no loss mesh filler, this in addition to being confined. If the material is appropriate, will end up settling for a wall of consistency and compactness, because weathering will act on it cohesionándolo. These meshes are flexible gabions, real barriers that make large fortress with multiple uses. The use of NGOs for Contflexdique barrier is useful for solving many problems temporarily or even permanent in various situations. Can be used, both in civil works, character as agricultural and livestock, and also in cases of emergencies such as floods are urban centers, protection of areas of cultivation, mouth water supplies or irrigation, etc.. The NGO can study in advance the needs of a population for true protection projects Contflexdique placing barriers with little investment, using the help of the affected people themselves, for: control flood water weakening its strength in the ravines; carry water retention; protect major infrastructure; make small dams; organize crop fields; protect livestock by barriers placed in front of the hedges; and bypass farms, schools, hospitals, etc..
With minimal forecast can solve big problems because once the facts and the damage occurred and generated, repair cost is much higher than the prevention. We are confident that this product will be of great interest to the solution of many everyday problems in populations, even today, suffer hardships in today's world should not be permitted. There are multiple uses that can give contflex barriers. In a population, with earth barriers Contflexdique, can develop a project to solve many problems of economic and simple way which occur before: city ​​protection, channeling water, flood protection, diversion of waters from flooding, etc..
To regulate the waters of the gullies should make small dams and sinks, so that water out losing strength and will not generate significant damage to populations, fields, etc.. If there, these dams are made of reinforced concrete or stone filled gabions, as sinks. The cost of this work is very high and requires, normally, staff some specialization, encofrados important, etc.. Actually not often have the media and therefore not performed, repeated year after year the same disaster. In these cases, these dams could be built by using barriers Contflexdique, although it did not exceed in strength to the concrete walls, yes that would perform the function similarly, getting mitigate damage in flood water in the ravines. The barrier extends Contflexdique and its cells are filled with soil, some walls so weighty that supply traditional prey with a minimum expenditure generated, and the land may be in the area and only the help of a machine is needed to throw. If you want to Sinks, is done in the same way. Logically, the cost savings is great. The work can be performed by the same locals. With this, finally, ensures that the water will damage laminate and are much smaller or nonexistent. Sometimes it is necessary to divert the waters of a small river or provisionally fixed. This is achieved with the construction of earth barriers to direct water Contflexdique was the area where interests, without the need for reinforced concrete walls or stone walls, with what it means to economic savings. By placing Contflexdique lines parallel paths we can raise to the desired height, filling the space between them, without worrying about the ramparts. Really barriers are acting as lost formwork on earth with which the road rise. Contflexdique placing lines parallel to the road and separated by measuring width desired, just enough to fill the space with land for the greater width. To prevent rainwater to run out destroying the lateral edges of the roads, the Contflexdique lines are placed on the sides in the direction of this, so as to make small retaining walls. Contflexdique separated by lines of different widths and height up in a pyramid shape, earth dams are built of a certain size. The lines make Contflexdique formwork middle ground between them, gravity dam forming the inner. The soil is easily compacted to not be required to be aware of the embankments, facilitating the work. Also, land directly exposed to water are under the barrier. Logically, if desired, can cover the outside with land to plant vegetation, concrete coat them, etc..
Often riverbanks deteriorate, falling part of the field and making holes in them. With Contflexdique barriers may be closing those breaks ground, filling and raising to the level of the top field. They are also used as protection on the banks of the river forming small dikes that protect the strongest flood water, reinforcing, so, the river banks easily, with few economic means. With the barrier can be reinforced earth embankments Contflexdique, latter acting as gravity wall and containment, by placing the necessary lines in both horizontal and vertical to achieve stabilization of the land. By filling land of barriers Contflexdique, the perimeter walls or fencing of ponds or tanks are constructed, so, easy and economical way of the boundary walls are made, it being the only place that makes waterproof sheet resting on these background. Very simply, a raft that is installed, if required, can be constructed by the farmer or rancher. These rafts can be fixed or temporary. Also, are very interesting for the agricultural world, seals as water or livestock populations, and to adapt the water at room temperature prior to use in cultures, such as in the rice fields. It is an easy way of signaling boundaries, for the same land can be filled barriers, doing compartmental boundaries which are desired. With barriers Contflexdique, can build the embankments or field margins, giving greater stability to the same and avoiding cracks and leaks that may occur between parcels. This may be performed in newly created fields, proceeded leveling or producing fields. It is very useful in the assembly of the steep banks of the rice fields, since these are often flooded and cause numerous problems. 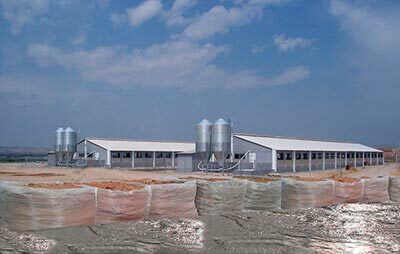 In agriculture it is often necessary to separate the products harvested within a building, Contflexdique the barriers can be made using their stockpiles of these different cells. It is suitable as a container for different products in a single line or multiple, in this case the barrier is filled Contflexdique desired product. These barriers are elements that act as barriers to the exit of vehicles in curves, protection in side roads to steep slopes, etc.. In addition to being its landfill, is greater cushioning for a possible hit with vehicle. It is a simple way to make anti flood levees quickly and with few resources, protecting all that is desired: infrastructure, livestock buildings, fields, urban, etc.. Using land filling, the barrier Contflexdique, can make passive fire barrier, placing it in places that are necessary.